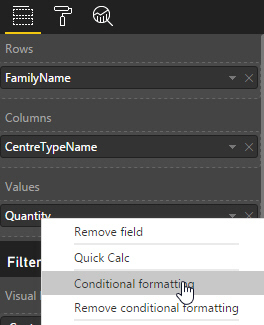 A summary of the (small) changes in Microsoft's January 2017 Power BI Desktop update. You can see a list of all updates going back to November 2016 here. The matrix looks a bit silly, as the blank values are coloured. Right-click on a matrix or table's Values field, and choose this option. Display blanks as they are, as if they contained zeros or in a specific colour. The Don't format option ... doesn't format the blanks! Try to make sure it matches, though!